Peroxisomes have important roles in maintaining homeostasis in humans. This is highlighted by fatal genetic disorders in peroxisome biogenesis. This disorder includes Zellweger syndrome, which is associated with impaired brain development, hypomyelination in the central nerve system, and progressive loss of hearing and vision. 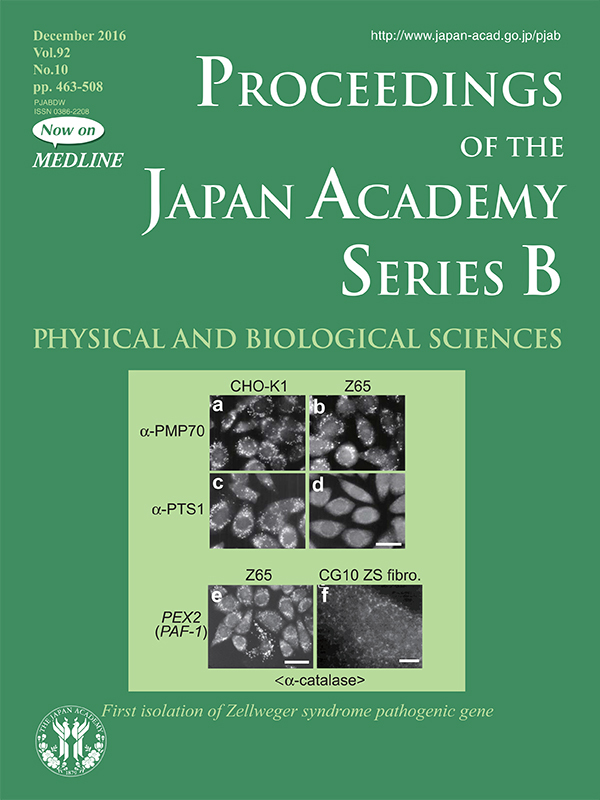 To investigate biogenesis of peroxisomes and its disorders, Fujiki and his colleagues mutagenized Chinese hamster ovary (CHO-K1) cells, and isolated a dozen of mutant cell lines that were defective in various processes of the peroxisome assembly. They then applied the forward genetics or expression cloning strategy to isolate genes (PEXs) that were involved in the peroxisome assembly. This invaluably contributed to identify the genes responsible for human diseases caused by the impaired peroxisome biogenesis. In pages 463-477 of this issue, Fujiki reviews the field of peroxisome biogenesis. Front cover: Identification of the gene that is mutated in a patient of Zellweger syndrome. In upper 4 panels, the wild-type CHO-K1 and its mutant (Z65) that was defective in importing peroxisome matrix proteins were stained with an antibody to peroxisomal membrane protein PMP70 (a and b) or antibody against PTS1 peptide of peroxisomal matrix proteins (c and d). In Z65, PMP70 was localized in peroxisomes, but proteins carrying the PTS1 were not in the peroxisomes, indicating that Z65 is defective in transporting matrix proteins into peroxisome. In lower panels, the Z65 cell line (e) and a fibroblast cell line from a Zellweger patient (CG10 ZS) (f) were transformed with PEX2 gene, and stained with an antibody against catalase. 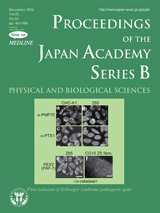 Localization of catalases in peroxisomes of PEX2-transformed cells indicates that Z65 CHO cells and CG10 ZS human cells have a mutation in PEX2 gene, and PEX2 protein is essential for importing peroxisome matrix proteins such as catalase into peroxisomes. Scale bar, 20 µm.